In 2013 Marty Morrissey delivered a short television piece for RTÉ ahead of St Thomas's appearance in the All-Ireland club final. Using the soundtrack from The Waltons, players were filmed demonstrating how you could puck a ball from one hurling household to another. The impression given was of a compact hurling community, rural in character, living the big dream. It captured the universal message of similar communities over the years but it would have been impossible without one family in particular. The Burkes provided six players, five starting the final six years ago and another, Eanna, coming on during the game. Their father, John, was the team manager. The Burkes are now down to five hurlers and their father left last year to become part of the management team at Oranmore-Maree, leading them to a recent All-Ireland intermediate club title. One of his sons, Sean, moved to London for work, and Kenneth, the eldest, is injured but was an instrumental part in their run to the final. After the last three All-Ireland titles were won by city teams boosted by large urban populations, this year's final will see a return to country clubs. Ballyhale Shamrocks became the first rural winner of the senior club title in 1981, when defeating St Finbarr's, before going on to become the most successful club in the competition with six triumphs. Six years ago when he visited south Galway, Morrissey took some poetic licence. It might have been stretching it to claim that you could puck a ball from Conor Cooney's garden and see it land in John Burke's. But the message was essentially true. "We are a very, very small area," as John Fahey, club man and a former Galway hurling secretary, emphasises. The area around Slieve Aughty at one side of the twin parishes of Peterswell and Kilchreest was once a thriving community, which it is no longer. When the club won the All-Ireland in 2013 the two local primary schools, combined, had around 130 pupils. Now divide that into each juvenile age group, and then again on gender lines, and reduce once more to allow for those unwilling or unable to play hurling and you see the sheer wonder of what St Thomas' achieved. But they could not have done it without the Burkes because the figures just aren't there. "Look it," says Fahey of the Burkes' contribution, "it happens once in a lifetime you could say. I know that there is no family in our parish with that number partaking in the underage structure. Maybe two or three brothers all right. The last time we won, we had the six Burkes, three Cooneys, and two Skehills; it was easy to pick a team after that." Rural depopulation remains a real worry for the GAA in those areas. Fahey points out that at one stage, in the distant past, Peterswell alone was able to win seven senior championships in the space of 18 years. Around the turn of the 20th century, numbers were so flush that one year the club had a dispute and fielded two teams. They met in the county semi-finals. In 1968, left with no choice, the two parishes of Kilchreest and Peterswell joined and St Thomas's was born. Large families were a feature and mainstay of previous Galway club success. In 1980 Castlegar became the county's first All-Ireland club winner when they defeated Ballycastle in the final in Navan. "That surpasses everything," declared John Connolly afterwards. "It was my most satisfying win ever." Later that year Connolly might have revised that opinion when Galway won the All-Ireland after a gap of 57 years. But you couldn't count on it. He had four brothers on the Castlegar team and another two on the bench. The Cooneys from Sarsfields were also notably productive. In 1993 Peter Cooney captained the team that won their first All-Ireland club title, with four other brothers on the team. The next year they retained the title, creating history, with five brothers again playing. Sarsfields don't have any families of that size now but the club has managed to stay competitive and remain in senior hurling, and the underage section is in a healthy state. Had Marty Morrissey brought the same presentation idea used for St Thomas's in 2013 to Ballyhale in 1981, before they won their first All-Ireland, he would have been able to achieve a similar dramatic effect. Having seven brothers in one club team that reached the summit of an All-Ireland win is a record that is never likely to be surpassed. In the house in Castlebanny in south Kilkenny that Kevin Fennelly Snr bought and moved into around the turn of the 1960s, seven hurlers were reared and went on to achieve lasting fame. The Shamrocks club emerged only four years after St Thomas's came into being with the merger of Ballyhale and Knocktopher, two sides traditionally different in outlook who realised that to survive it made sense to work on the things they had in common. On their first county senior championship-winning team in 1978, five of the six forwards were sons of Kevin Fennelly Snr, whose wife's sister married Brian Cody's father, Bill. The exception was Patrick Holden, father of the current Kilkenny player, Joey. When they won their first All-Ireland in 1981, the youngest of the Fennelly brothers, Dermot, made it seven brothers featuring on the same team in the final. The density of hurlers in a relatively remote rural area is still well above average. Across the road from Fennelly's farmhouse is the homeplace of Maurice Mason, the team's centre back in the 1970s and '80s and the corner of the parish where his grand-nephew Dean, the current goalkeeper, was brought up. You could puck a ball across to Mason's garden from Fennelly's. You might not get one to Henry Shefflin's new house up the road in Kiltorcan, or the one that TJ Reid comes from nearby, but they are not far out of range. A dozen of the team that started the semi-final win over Ballygunner are from the two townlands of Kiltorcan and Castlebanny, situated side by side. Michael Fennelly was co-manager when they won a fifth All-Ireland in 2010 when his sons Michael and Colin were involved. His sister Monica has four sons on the current outfit - Darren, Patrick, Adrian and Kevin Mullen. The Fennelly influence lives on. In south Galway they know these days may soon be gone. Trying to constantly produce underage teams with limited resources is a challenge that has proven too much for some clubs. Kiltormer won an All-Ireland club title in 1992 and had to forge links with Mullagh up to under 21 to survive. "That is not unusual," says John Fahey. "Right throughout any part of Galway you will see that. North Galway the same, west Galway worse again. Population is a big problem in the west of Ireland in being able to field. "Then there is always the difficulty with people about identity. Older people would always like to hold on to their identity." If that was an issue in south Kilkenny in the early 1970s, when talks were taking place to form a new club, it did not prove enough to stop it from being established. There are no reservations expressed now. Out of those beginnings has emerged the most successful club in the history of the club championship. Their first All-Ireland in 1981 was unexpected, with St Finbarr's, champions in 1975 and '78, chasing a hurling-football double. The Fennelly influence played a major role in creating history. Their first score came from a Ger Fennelly free. Brendan Fennelly put them in front for the first time. Kevin Fennelly, in goal, made a vital save after 12 minutes. In the first half Dermot Fennelly came on for corner back Watty Phelan. Fennelly went to left half forward in place of his brother Ger who was moved to midfield, another brother Sean going to half back and Frank Holohan into the corner vacated by Phelan. The switches proved crucial. The changes settled the Ballyhale defence and helped turn the match. 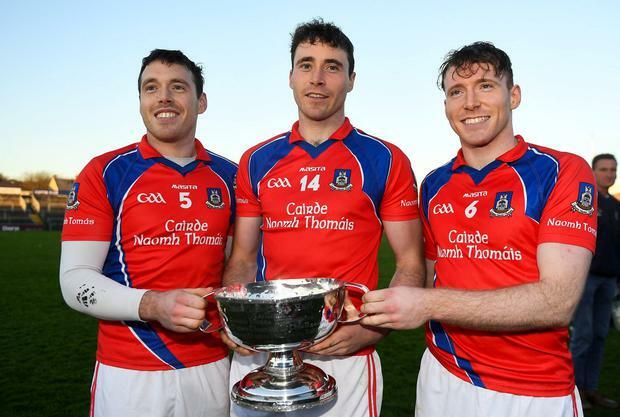 In the second half Liam Fennelly scored the Ballyhale goal and a late goal in return from Jimmy Barry Murphy could not save the Cork champions. It was a first strike for a rural bidder, a breakthrough success. Even with smaller families and dwindling populations, they are still coming back for more.